to share the activities that you feel are most important with your surgeon and prosthetist, so an appropriate prosthesis can be provided for you. Prostheses can restore length to a partially amputated finger, enable opposition between the thumb and a finger or, in the case of a prosthetic hand, stabilize and hold objects with bendable fingers. If your hand is amputated through or above the wrist, you may be given a full-arm prosthesis with an electric or mechanical hand. Some patients may decide not to use a prosthesis. A prosthesis is made from an impression cast taken from the residual finger or limb and the corresponding part on the undamaged hand. This process can create an exact match to the details of the entire hand. 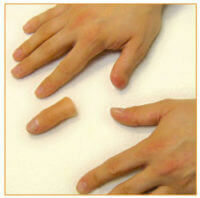 The prosthetic finger or hand is made from of a flexible, transparent silicone rubber. The colors in the silicone are carefully matched to your skin tones to give the prosthesis the life-like look and texture of real skin. The prosthetic is usually held on by suction, and the flexibility of the silicone permits good range of motion of the remaining body parts. Fingernails can be individually colored to match almost perfectly. The nails can be polished with any nail polish, and the polish can be removed with a gentle-action nail polish remover. Silicone is resistant to staining, so inks wash off easily with alcohol or soap and warm water. With proper care, silicone prosthesis may last 3-5 years. Usually, three months after you are completely healed from surgery and all swelling has subsided, creation of your prosthesis can begin. You may need therapy to learn to use your new prosthesis.